The reception area welcomes visitors for introductory lectures and films, classes and other services and Church activities that are part of a full weekly calendar of events. The Public Information Center features multimedia displays on the beliefs and practices of Scientology, and is open daily to the public for self-guided tours. In order to understand the Scientology religion one should also learn something about its Founder, L. Ron Hubbard. Therefore, a portion of the Public Information Center also features multimedia displays about his life. Introductory lectures on Dianetics and Scientology are conducted regularly in the Seminar Room. The room is also set up with a state-of-the-art audio-visual unit capable of airing films as well. 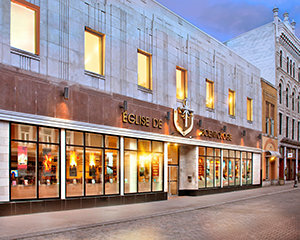 The new Café at the Church of Scientology of Québec provides an ideal spot for parishioners and visitors to meet for refreshments. The Chapel serves the congregation for Sunday Services, Weddings, Naming Ceremonies and other congregational gatherings including weekly graduation celebrations acknowledging the accomplishments of parishioners who have completed courses of study or spiritual counseling. The Bookstore provides all the written and recorded works of L. Ron Hubbard, which constitute the Scripture of the Scientology religion. The Purification Program is a precise and closely supervised regimen engaged in by parishioners to address drugs and toxins as barriers to spiritual gain. Parishioners who desire spiritual counseling may await a minister in this lounge adjacent to the Hubbard Guidance Center. Scientologists pursue their studies of Dianetics and Scientology in the Academy Course Room in the new Church of Scientology of Québec. Every Church of Scientology has an office for L. Ron Hubbard, Founder of Dianetics and Scientology, as a sign of respect and representing the fact that the Church remains true to his teachings. Since 1976, we have served our growing congregation in this living heart of French Canadian culture. Today, we are honored to extend our help to communities across La Belle Province from our home below Old Town. To that end, we share our Church and our many social betterment and humanitarian programs with Québec. We look forward to working with every Québécois dedicated to uplifting society, and upholding the heritage that has imbued Québec with its indomitable spirit. Together, we can achieve our common dream of a drug-free, crime-free and flourishing future for all. 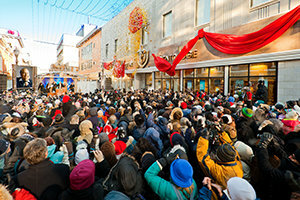 Fifteen hundred Scientologists and their guests from across Canada and the United States packed the street in front of 665 rue Saint-Joseph in the heart of the Nouvo Saint-Roch district of Lower Québec City to attend the opening of the Church of Scientology of Québec/Eglise de Scientologie de Québec on January 30, 2010.